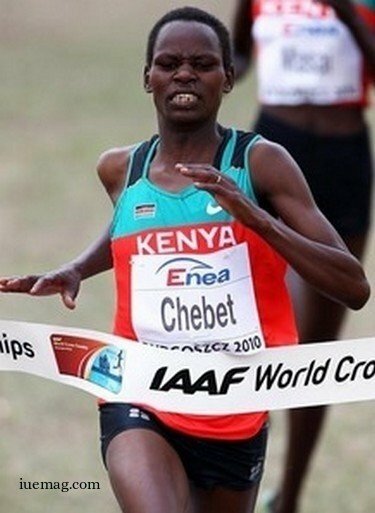 Hailing from Kenya, a country synonymous with athletics, Emily Chebet Muge is a long distance runner who specialises in 10,000 metres and cross country running. She has twice participated and won the IAAF World Cross Country Championships in 2010 and 2013 which was held in Bydgoszcz, Poland. Born on 18th of February, 1986 in a village called Ainamoin Bomet District in Kenya’s Rift Valley province, Emily took inspiration from her father Mr.Joel Rono, who was a Journey man runner. “I began running probably just because it’s a day to day thing in our community but I didn't know I would pursue it as a career,” she says. What served as an added advantage to her running and motivation was her friend Caroline Cheptanui Kilel who hails from the same village and Emily used to see her run and hear of her travels and got stirred up to start running like Caroline because she too dreamt to travel around the world. “Running has shaped various aspects of my life to a great extent. The athletic profession requires high levels of self-discipline and sacrifice to make it to the top. My virtues have been built, shaped and nurtured through the time,” she confides. She has also developed good sense of time consciousness. Time being an important element in the sport has to be used efficiently and she has been able to inculcate the same off the field. Being the second child from a family of eight children, her father not only inspired her but also gave her a moral support at tender stages of her athletic career. This support was then provided by her husband Mr. Edward Muge who is also an accomplished athlete and has played a major role in her success. “My husband has always been my support since he is my training mate and my coach as well,” she mentions. The first milestone of her life was her international debut in 2003 when she qualified for the world cross country championship. “Even though I finished 5th, that was the moment I was looking forward to athletics very seriously in my career journey,” expresses Emily. She might have lost the count of the numerous races she has participated, both on track and marathons, but she definitely can't dare to forget the ones which left her with immense pleasures, among which her two gold medals which proved to be a significant breakthrough in her career top the list: one in 2010 the IAAF World Cross Country Championships which she successfully defended again in 2013. “I believe the most important skill is being able to monitor keenly your competitors during a race. One should be able to keep up with the pace of your competitors without burning up and knowing the right moment to strike. This requires accurate timing else a single miscalculation can turn tables,” she advises the athletes who aim to find perfection in their profession. She also thinks that it is truly essential to choose the number of races to participate in a given season or else one might burn out. Emily was lucky enough to be mentored by her manager Zane Branson together with Davor Savisa upon the choice of races to be participated which also gives her time to prepare adequately both physically and psychologically. Athletics is more of a personal effort sport rather than teamwork, and so, at times you find yourself competing with your friends and that puts you in an awkward situation but still at the end of the day there has to be a winner. “Competition with my athlete friends has been healthy and that has come a long way in building each other as we are able to share each other’s experiences both on and off the tracks. I have close friends with whom I have severely competed neck to neck, this includes: Mercy Cherono, Faith Chepngetich, Joyce Chepkirui - some of them are my training mates. It’s amazing that after a tough race we can afford to smile and pat each other on the shoulder with a word or two about the race,” she narrates. “Sports like any other discipline in life requires hard work, sacrifice and patience, else nothing good comes on a silver platter. However, when you make it in life don’t forget where you came from. Be humble and support those who are behind you and those who draw inspiration from you,” Emily Chebet Muge. Any facts, figures or references stated here are made by the author & don't reflect the endorsement of iU at all times unless otherwise drafted by official staff at iU. This article was first published here on 20th April 2015.